There could not have been a more appropriate theme for the evening. With the combination of rain and Hyperfix we arrived just seconds before Tracy’s set. Chapman’s performance at the Murat evoked smiles, tears, stomps, screams, and claps from her audience. Her gentle demeanor shone through like the sun in the dark theatre, thanks in part to the work of the lighting technician whom may have been more impressive than the back up band. The music was simple but the dominant, heartfelt lyrics compensated for the simplicity. Tracy prepared her audience for the night with “Say Hallelujah” and was followed by “Why” which is a perfect song for this time in history. “Why are missiles called peacekeepers when they are aimed to kill?” Her audience was screaming requests between songs. Tracy said she had walked to dinner (at YATS downtown) before the show and someone asked her to sing “The Promise”. This ballad brought smiles to my face and as I skimmed the crowd, I witnessed some people crying. She catered to her audience requests once more by playing “Fast Car” with different hues of red in the background. The band shined as a whole on the next song “If I Never See Another Sun” wherein I must mention the superb operation of the lighting once again. The stage gleamed in orange with spokes of yellow. And of course, she played her hit “Give Me One Reason” twice at the end of her set. First the radio version, then a high speed blues rendition. Give me one reason to play this song TWICE. In Tracy Chapman fashion, she brought the crowd to their feet with her encore of the traditional Bob Marley song “Get Up, Stand Up”. 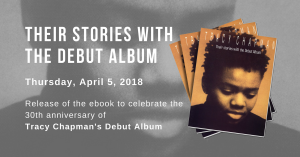 Tracy Chapman exhibits an exceptional style of reaching out and touching the emotions of those around her. She flawlessly delivered her unique voice and soulful style to a much appreciative audience. She captivated everyone with her beautiful lyrics and sparked the inner spirit with hope and peace while massaging the soul with tranquility.